This is not strictly a collection, but the pick of the best pieces, from all collections, ideal for that special day. If you don’t find what you are looking for please view the bespoke section of this website or contact me using the contact form to discuss a commissioned piece. 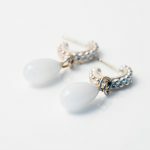 A beautiful and simple silver beaded ring hoop earring with a pearly white antique glass drop bead. This would compliment any piece from the Beaded and Beaded Ring collections. A simple and beautifully tactile little pebble stud with a creamy white pearl drop. 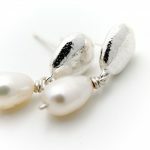 The solid silver earring is an exact replica of a tiny beach pebble (including the intricate surface texture), with a lovely freshwater pearl drop. 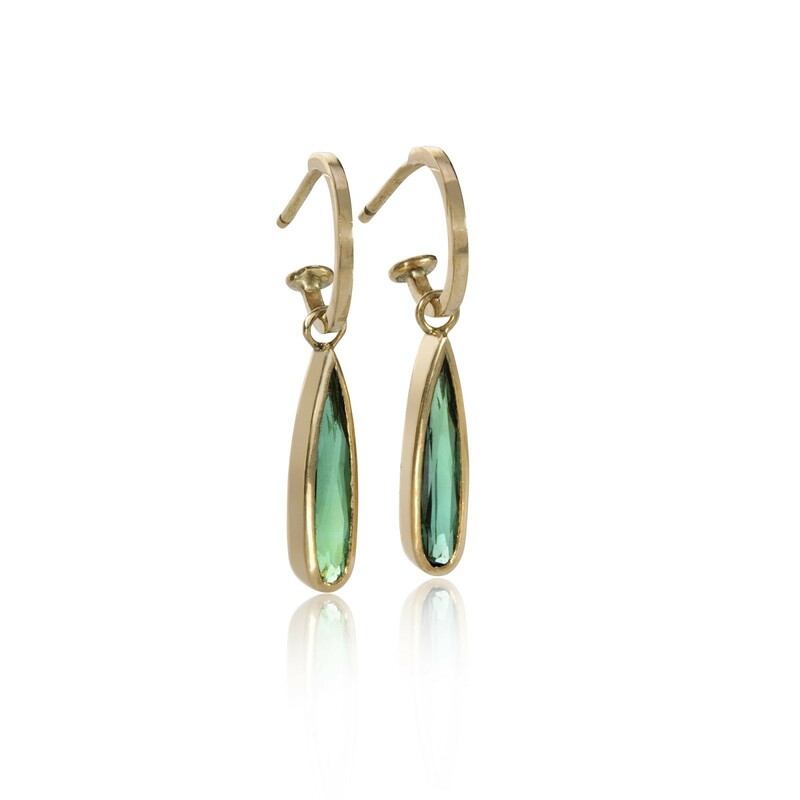 Also available with a rainbow moonstone drop. A great gift for even the most fussy relative, but also another must-have accessory for your own wardrobe too! I simply love this ring and have made several different versions each totally unique. 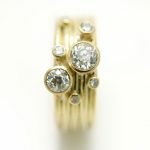 Can be made with 3, 4 or 5 narrow bands and various different sized diamonds set in 18ct yellow gold. If you are interested in having a similar piece made using your own stones or ones sourced by Alice please contact her using the contact form in the main menu. 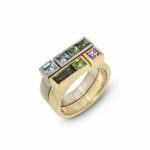 Prices for the ring shown start at £1500. 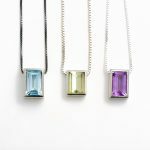 I have made a few different versions of these before finally producing this one in 18ct gold with princess cut diamonds and a pink Tourmaline. 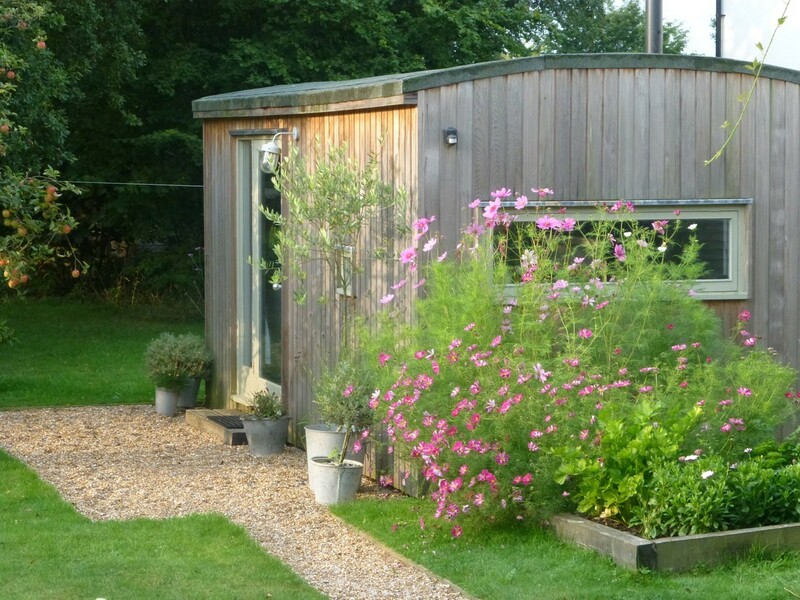 Simple and beautiful, it really has to be seen on to be fully appreciated. 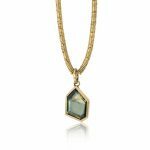 Its a delicate necklace that makes a bold statement. 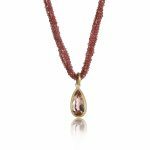 £3,995 (To purchase this necklace in 18ct gold and diamonds, please contact me using the contact me form) Available to purchase online in gold vermeil (gold plated silver), with cubic zirconium and rhodolite garnet stones set. 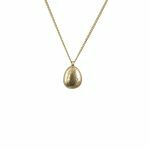 A contemporary 9ct Gold tiny bead encrusted ring necklace with an offset 3mm diamond. 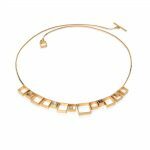 This is an elegant little gold necklace, perfect for an anniversary gift or a special birthday. Made to order so please 2-3 weeks for delivery. 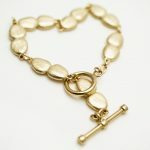 A very special bracelet made up of solid 9ct gold pebbles linked together with a ring and bar fitting. Price in the region of £750. If you are interested in purchasing this bracelet please contact us using the contact form in the main menu and we will give you a price based on the current gold prices.